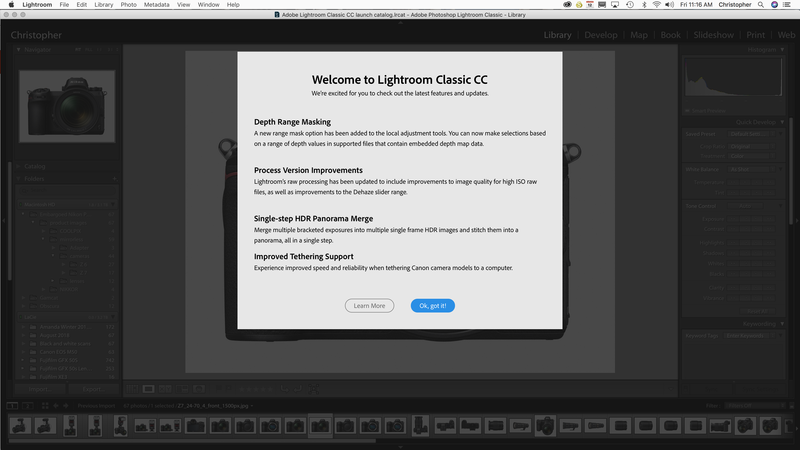 Adobe Lightrooms Classic CC, Lightroom CC, and Photoshop are getting updated, but that’s not the most exciting thing. Today at Adobe MAX, the company’s annual creative conference, the San Jose based software giant announced upgrades to Lightroom CC, Lightroom Classic CC, and Photoshop CC, as well as other applications in the Creative Cloud suite. Adobe also introduced Adobe Premiere Rush CC, an industry first all-in-one video creation and editing application designed with social media creators in mind, simplifying video creation as well as sharing on social media platforms like YouTube and Instagram. Details about the updates for photography related Creative Cloud applications as well as the full press release can be found after the jump. 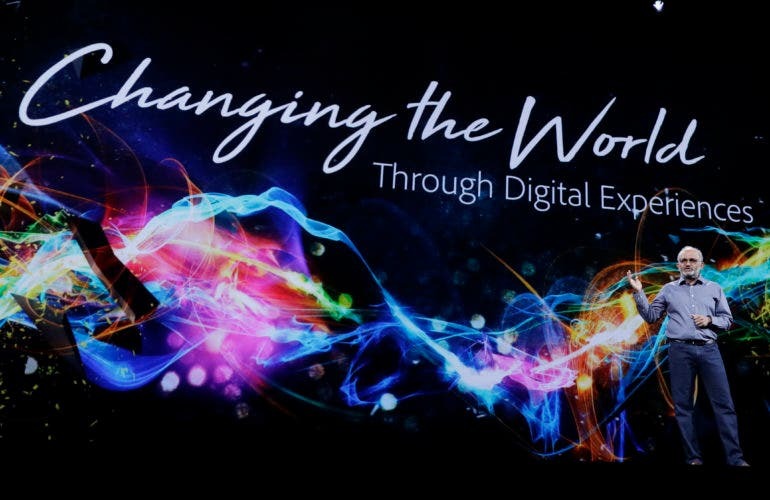 Adobe’s three major themes at MAX this year are to accelerate your work, liberate your creativity, and to drive new mediums. Another focal point Adobe is raising awareness on is the company’s dedication to multi-surface creativity, giving creatives the ability to work seamlessly on projects across desktops as well as mobile devices. While most of the announcements cater more to creatives working with the motion side of things and don’t necessarily have a huge impact for us photographers, Adobe is bringing some updates to Lightroom CC, Lightroom Classic CC, Camera Raw, and Photoshop CC as well. 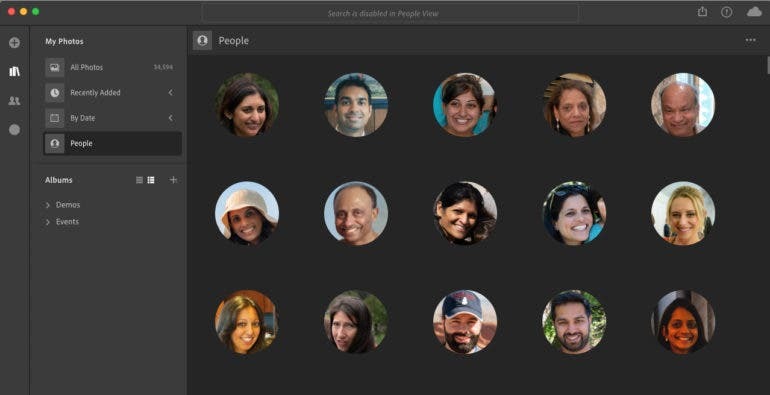 Powered by Adobe Sensei, Adobe’s own artificial intelligence platform, People View allows Lightroom CC users to quickly find people captured in your images. Lightroom CC will tag people in photos automatically and provide an easy way to see all the photos a certain person appears in. Automatic search suggestions (for metadata like cameras, lenses, aperture, ISO, locations, keywords, etc) will now appear as you start typing in the search box withing Lightroom CC, giving you better search results. Lightroom CC’s new Share tab provides an easy way to browse and access images and shared albums made through lightroom.adobe.com. 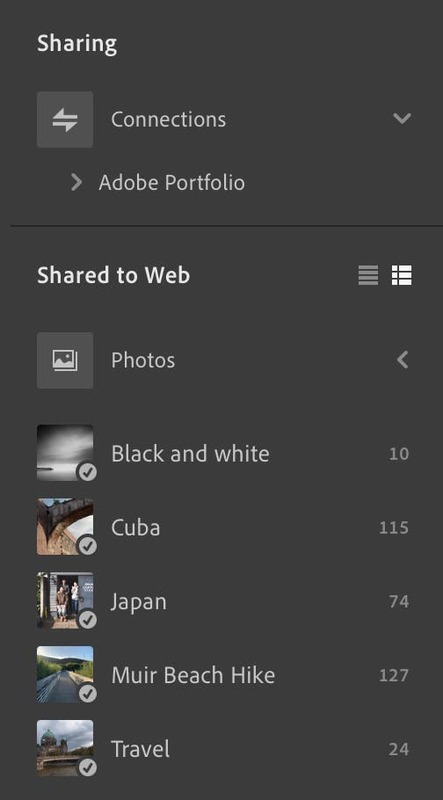 You are now able to share albums directly to your Adobe Portfolio from within Lightroom CC’s new Share tab using the new Connector feature. 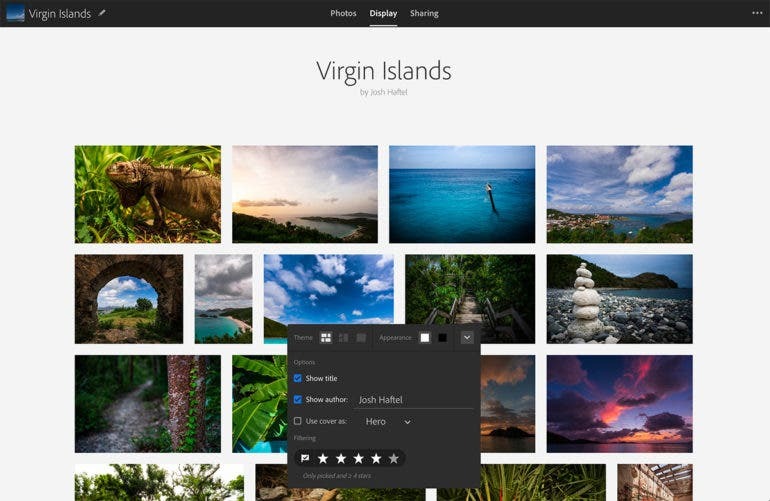 Third-party services such as photo labs, photo book printers, and others will be supported as Adobe builds out the Connector service. The Apple Photos Migrator simplifies the migration of your Apple Photos library into Lightroom CC on your desktop. 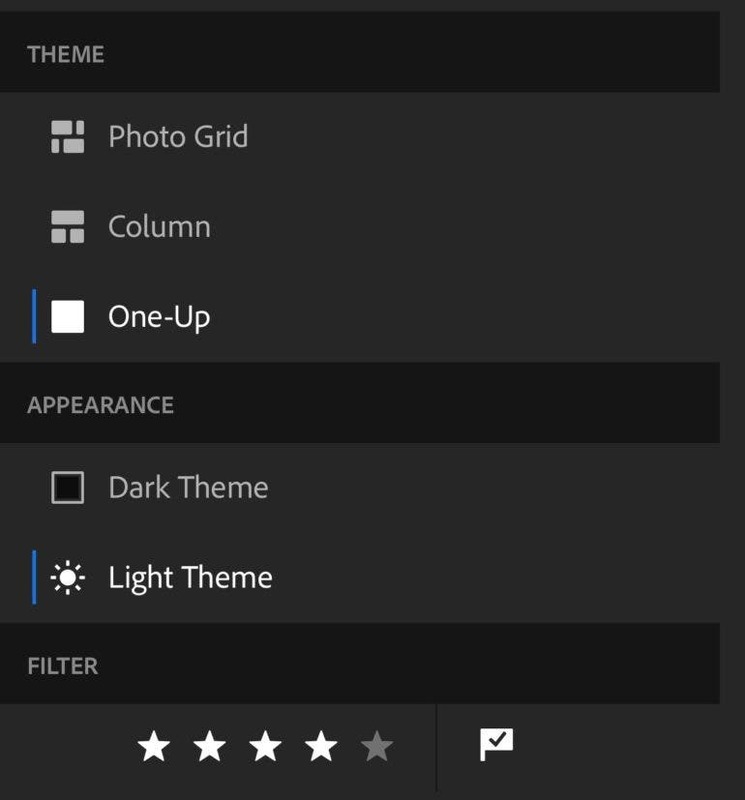 You can now choose to share only images that have been flagged or meets a specific star rating when sharing albums to Lightroom Web from within Lightroom CC, as well as control the album’s display theme. The new Display View within lightroom.adobe.com gives you a page preview exactly as your viewers will see it. You can control the layout and background color within the Display View while inserting breaks between images and text to help tell the story that accompanies your photos. Once you’re satisfied with the layout, you can easily share the album using the Sharing controls. Tethered capture is an integral part of many professional photographers’ workflows, and Adobe is promising significant speed and stability improvements in today’s update to Lightroom Classic (up to 1.5-2x improvement in transfer time). While this update improves tethered capture experience for Canon cameras, improvements for Nikon cameras are forthcoming in a future release. HDR Panorama Merge dramatically streamlines the workflow involved creating HDR Panoramas. What used to be a time consuming, multi-step process requiring careful attention now only takes a single step with the new “HDR Panorama” option within the Photo Merge menu, allowing you to merge a large set of bracketed exposures into a single HDR Panorama DNG with ease. A live preview panel gives you a look into how your pixel selection will determine the final fill, showing you changes to your image in real time as you brush on or erase the source content before even committing the change. A non-destructive output setting will automatically generate a new layer with the processed image while leaving your original image untouched. Photoshop CC’s new Frame Tool allows you to create placeholders for an image size or shape, automatically scaling your image to fit. You’ll also be able to convert any shape or text layer into a Frame for easy masking. A full featured version of Photoshop CC will be coming to the iPad sometime in 2019. Utilizing a modern touch and gesture-based interface, Adobe hopes to give creatives the ability to take their desktop workflows on the go, making it possible to work on the same PSD file seamlessly across multiple devices. Adobe MAX brings together the world’s best creative minds, industry luminaries and celebrities. MAX 2018 keynote speakers and presenters include Academy Award-winning filmmaker Ron Howard, comic book artist Nicola Scott, one of the world’s most prolific photographers Albert Watson and comedian Tiffany Haddish, who will host MAX Sneaks – a preview of technology innovation brewing in Adobe Research. MAX attendees will also witness an exclusive trailer preview of Sony’s upcoming feature animated film, “Spider-ManTM: Into the Spider-Verse,” and appearances by Questlove and Lilly Singh. 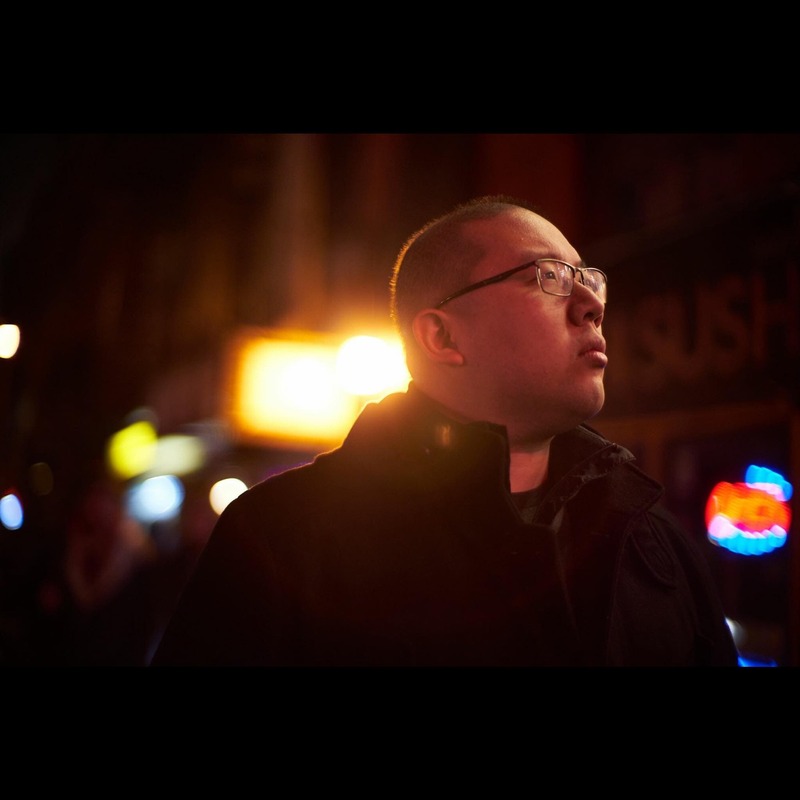 In addition, MAX brings together major technology companies including HP, CDW, Dell, Google, Samsung and Intel, and design-forward creative brands such as Adidas and Sony. A livestream of the Adobe MAX keynote presentations can be viewed here on Monday, October 15 starting at 9 a.m. PT and on Tuesday, October 16 starting at 10 a.m. PT.